Sammy came into my life as a round, plumb, adorable ball of a puppy. 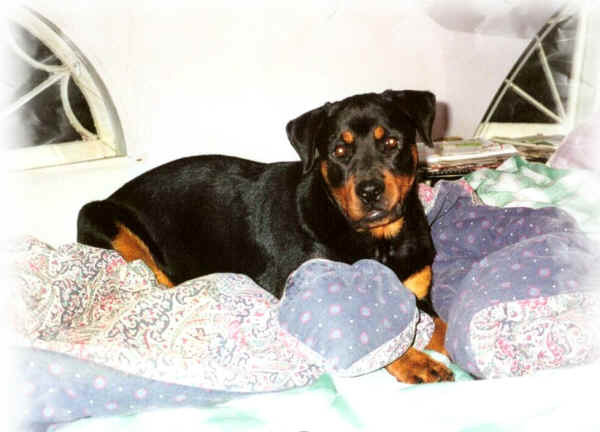 A purebred Rottweiler, he was the cutest little thing at the age of three months, shiny black with the trademark brown spots above the eyes. For me, it was love at first sight. Apparently, the feeling was mutual, as he took to me immediately after I took him home, following me any and everywhere with his clumsy little feet. I have so many precious memories of Sammy as a puppy, all special, always in my heart. I wish time could capture those moments so I can go back and relive the absolute splendor of watching this little monster grow up day after day. I remember one morning in fall, after raking up a huge mound of dried leaves in the backyard, without warning, Sammy came bouncing in and landed smack in the middle of the leaves, literally sinking down in the middle. It was the sweetest sight to look at him all round and wiggly, too fat to roll over on his paws as he enjoyed the feeling of the dried leaves on his back. Then he entered into what I call his ‘wicked stage’. Growing out of his puppy hood and into the phase of a young dog, his antics had me either roaring with laughter, or at times, I was almost compelled to pull my hair out. During this stage, I was quite often seen in public wearing shoes with bite marks on the heels, socks with holes (his absolute favorite), winter jackets with fleece hanging out and shirts without buttons. Furniture too, did not escape his onslaught of terror as arms of chairs were dotted with tiny teeth marks and the futon, covered in doggie hair (he believed it was his bed) caused nervous glances from visiting guests. On many occasions I came home and entered my bedroom, only to witness what seemed like an avalanche, as all the fluff on the pillows would be scattered madly across the bed. At times like these, I would look at him in anger, only to find him watching me as if he too, was confused as to how this happened. Ever my shadow, he would always position himself where I was in his line of vision, content to lie on the ground chewing a doggie bone, frequently glancing up to ensure I was within sight. When I was busy preparing meals in the kitchen, he was my food sampler, soon after developing a special taste for tomatoes, pine, V8 tomato juice and peanut punch. At this point in time, he was in his ‘fear’ phase, actually AFRAID of other dogs, cats, squirrels, basically every living creature. I spoke to the vet about this, concerned that Sammy was not developing as he should, but he assured me if was normal with his age. (I actually had sleepless nights worrying about this situation). Then that phase started wearing off. I should not proceed without mentioning the embarrassment he caused on the few occasions when he ventured into the neighbor’s yard and scattered all their garbage (ate some of it too). Worse still was the time he spotted the neighbor’s cat and before I had time to restrain him, he took off behind Silk, running him around and around his own house! Thank heavens the neighbor’s were not home that day because I had to go over on their property and literally drag Sammy back home. Going for walks was a special treat for me, because it allowed me time to absorb the beauty of nature. Sammy too, seemed to breathe in new life when we went on our walks, serenely calm, just enjoying trotting along in silence. This was before he grew too big for me to drag him back home when he just ‘felt’ like rolling over on someone else’s freshly mowed lawn. At those times, I would have to get on my knees and beg him to behave before the homeowner came outside and saw an overgrown Rottweiler relaxing on his property as if it was his home. Then winter came around. We went for a walk one afternoon after a particularly heavy snowfall. I remember observing the expression on his face as he stood gazing in obvious confusion at the snowy mass around him. Then, after apparently making up his mind that he loved snow, he dived straight into it and (I swear!) started to swim. His stout, black body would disappear into the snow, resurfacing about five feet away, his head and nose covered in the snow. I don’t know if this is normal, but he has actually eaten large quantities of snow. He seems to love it. Maybe he confuses if for ice-cream…maybe he’s just plain mad. But these antics slowly disappeared as he entered into his second year and, increasingly, his protective demeanor evolved as he became an adult dog. I would categorize his personality as the strong, silent type. Now content to stay by himself most of the time, chewing on some bones, or just half-way asleep as he still protectively observed me while pretending to be asleep. It became quite humorous to me, that, the slightest sound that I emitted, whether it was a sneeze, a cough, or a lazy sign, became a source of concern for him. He would run to me and sniff me to make sure I was ‘okay’, give me one final searching look and go back to brooding in a corner. For Rottie owners out there, you would know the joys of waking up every morning to a wet, cold nose trying to search you out from under the covers. It’s useless trying to sleep as our fateful companions become convinced that we are playing hide-and-seek under the comforters. Worse yet, don’t wiggle your toes under the covers, for it appears to our doggies that some alive creature is under there. They will pounce on your precious toes and try to ‘kill’ it. Be forewarned. Today, Sammy is a healthy 165 lbs. fellow. Handsome, gorgeous, the king of the block. Very territorial, no other dog dare pass on his street. It’s a secret code in the dog’s mafia world. If words can express the love I feel for my boy, I will tell you what it’s like to fall in love with an animal so completely, your entire life becomes revolved around him. But I can’t because words cannot do justice to the way I feel about him. They say a dog is man’s best friend. That’s putting it too lightly. They were sent here to protect us, to look after us, to love us unconditionally because no other human would, to look at us with their soulful eyes letting us know they care…they are, without doubt, our guardian angels.